Since 2007 a number of African countries including Zimbabwe have adopted male circumcision as another HIV prevention strategy following recommendations by the WHO and UNAIDS. The study interrogates this simplistic portrayal of male circumcision by first identifying and examining the discursive shifts regarding this practice since colonial times. 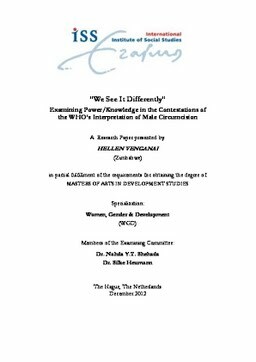 Using the Foucauldian approach to power and knowledge, the research explores the representation of male circumcision by specific powerful western dominated institutions notably the WHO/UNAIDS and the church. Taking male circumcision as a case study, the study challenges the perceived neutrality of development and scientific health discourse revealing instead how these discourses are used not only to justify interventions, but to also sustain the unequal power relations between powerful institutions and indigenous people – the former having more power to name and shame. After analysing the data, the study problematizes the monolithic presentation of the West by revealing the conflicting interests of the WHO/UNAIDS and the church as well as the complexities and contradictions in their discourses regarding male circumcision. Sometimes the discourses contradict each other as the study shows; sometimes they reinforce each other, but are never monolithic. Further, the paper highlights the plurality nature of the discourses of the people, unlike Escobar and Said who homogenize both the West and the rest and ends by advocating for pluralities rather than singularities in studying these discourses as a way out of these dichotomies. Methodologically, the study highlights the importance of the need to transfigure the conventional way of doing research (i.e. attempting to fit data within a predetermined model) and proposes elasticity where the data gathered should instead determine the choice of the theoretical and analytical framework.